"Food to empty dog dish, gulp!" Being an intellectual puppy, I love intellectual games as well as traditional dog stuff. I mean, I still fetch (with the right incentive), play "tug of war", go for walks, etc; but I also like to use my brain too. I prefer Jeopardy! to Wheel of Fortune, actually watch the news (although most of the stuff that happens outside my own backyard I don't always understand), and I love chess. That classic game of knights, pawns, queens, kings, bishops, etc. A game of strategy and wits in a bloodless battle on a pretty simplistic field of honor. Or in other words, I'm posting some chess themed jokes today. Ready? In a park people come across a man playing chess against a dog. They are astonished and say, "What a clever dog!" But the man protests, "No, no, he isn't that clever. I'm winning three games to one!" "Maybe, but don't get rooked into paying a high price for it." One friend said to the other, "I saw an explosive game of chess the other day," to which the other replied, "How so?" 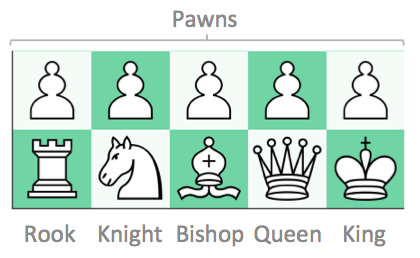 "The first move was pawn to c4!